5th grade. Ohio. Kent State University. 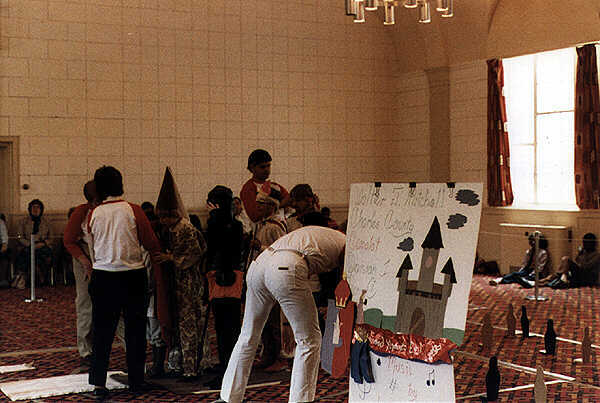 My teammates and I from Walter J. Mitchell elementary school in Charles County Maryland prepare to begin our solution to the "Camelot" problem at the 1984 Olympics of the Mind world finals. The Camelot problem involved a team of five members who accomplish a number of "brave things" and "good deeds" on a prescribed course while blindfolded. Team members -- King Arthur, Guenevere, Sir Lancelot, Sir Gawain and Sir Galahad -- must communicate with one another with methods other than language. The specific tasks are: (1) King Arthur must pull the sword, Excalibur, from a stone; (2) Sir Gawain must joust the Green Knight; (3) Sir Lancelot must remove a dragon's fire (that was my job); and (4) Sir Galahad must rescue a damsel in distress. On the way to their tasks King Arthur and the Knights must also rid the world of "evil," by knocking down the black props [picture, bottom right] while leaving the gold ones untouched. Due in part to some last minute changes we had to make to the props, we were only able to place in the middle of the pack, 13th or something. We took the bronze in the computer competition.